Punjab celebrates life and an integral part of that is certainly yummy and sinful food. 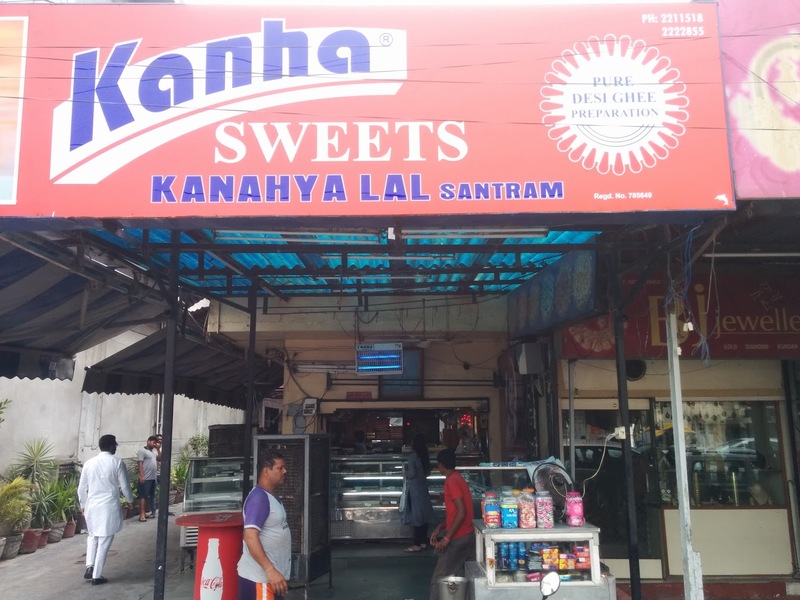 Amritsar is known for it's Golden temple but it is also famous for the finger licking food that it offers and there are so many eat outs to explore that it definitely required a stand alone post dedicated to food. We extended our stay to taste the best of Punjabi food that took us to a century old dhaba in the narrow lanes of Amritsar- "Kesar Da Dhaba." 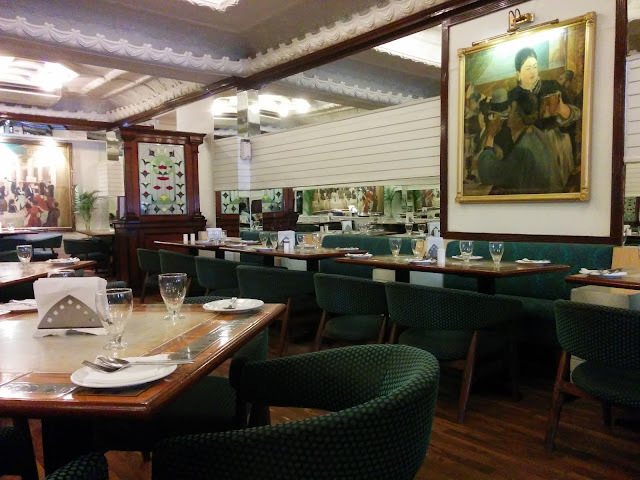 This eat out established in 1916 serves only vegetarian food and it was one of the most soul satisfying meals. We ordered butter Missi roti, a massive crispy roti beautifully garnished with coriander seeds and a rich dash of desi butter and Kadai Paneer which beautifully complimented the roti. The paneer was super soft and the gravy not too spicy. Their simple yellow dal fry is a must try, it was very well done and topped with rich desi ghee. They also serve Thali and all dishes are available in half portions as well and one must certainly try their amazing thick ice cream like "Kesar Lassi." 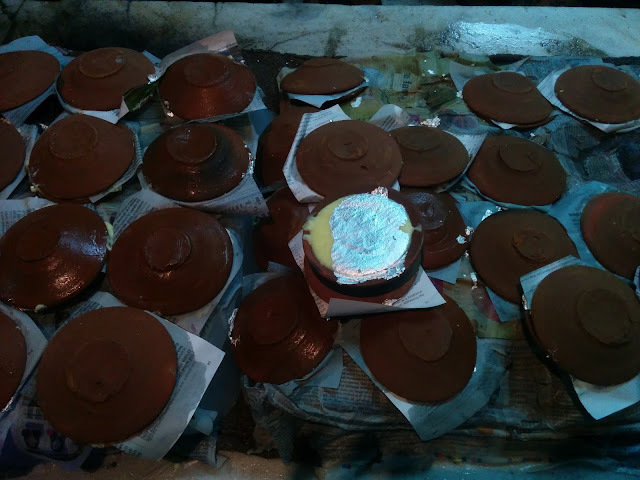 All of this costed us Rs.370. Post the sinful and heavy dinner we went out for a short walk and returned to Kesar Da Dhaba to try their "Phirni"- a dessert served in matka. This was just amazing not too sweet and just tasted natural. Priced at Rs.15 only, the Dhaba is open from 11am to 11pm. Their seating arrangement here is very home like or old school style. Their service standard is just commendable, the guys here were very cordial and helpful. They patiently explained us how they preparpe their dishes and what ingredients are used, answering all our questions with a smile. Though we were on a road trip we opted for a auto-rickshaw to reach Kesar da Dhaba as it is near impossible to find a parking spot in the narrow lanes for a two wheeler. Among many other things Punjab is very famous for its thick lassi and one place that stands out is Ahujha's Lassi near Hindu college. 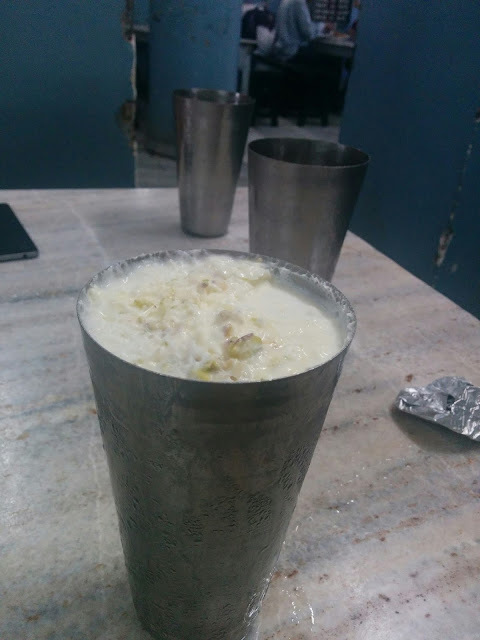 A massive glass of lassi is priced at Rs.35 and it could very well be considered as a full meal for an average adult. Their namkeen lassi too is out of the world. Apart from lassi, they also serve sweets and snacks. Another famous and must try Lassi spot is Gian Di Lassi wala, this is on the way to Hindu college. Any local would be able to guide you to this shop. This is again a century old place that has carved out a niche for itself. They serve sweet and namkeen Lassi priced at Rs.35 and a smaller portion is available at Rs.20. 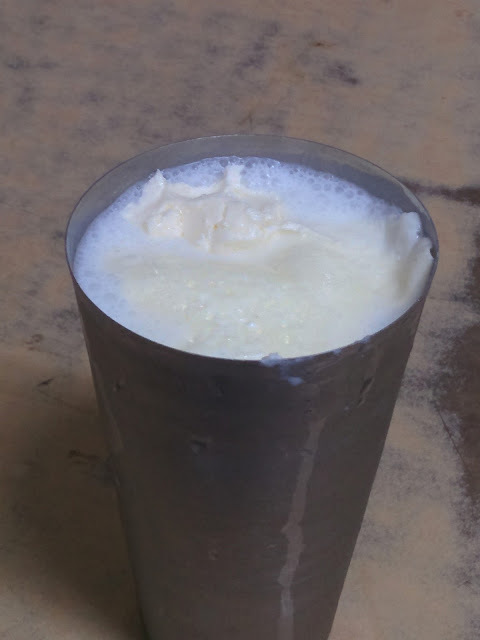 The amazing Lassi is topped with Malai and desi butter. In case you are a fan of namkeen lassi, it is available only till early evening. 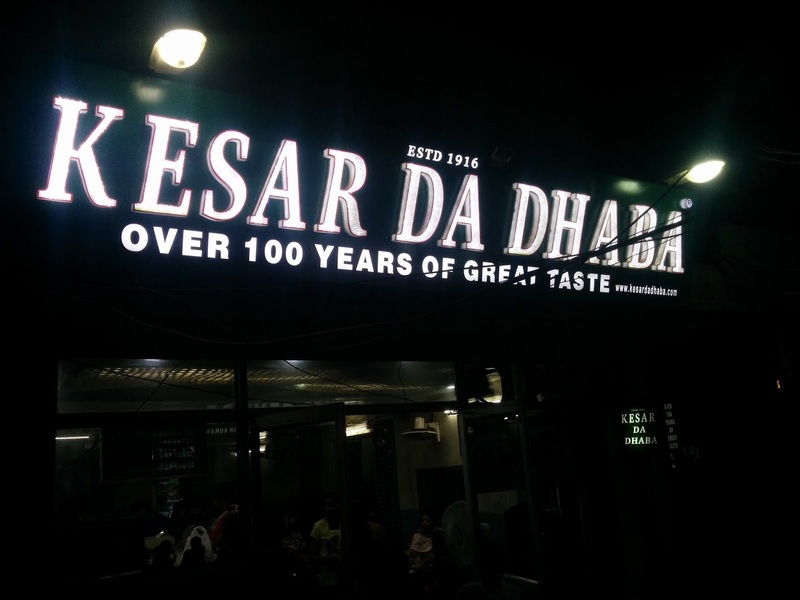 After trying the much famed Ahujha's, Gian Di Lassi and Kesar da Dhaba's lassi, the trophy definitely goes to Kesar Da Dhaba and close second finishes Ahujha's. 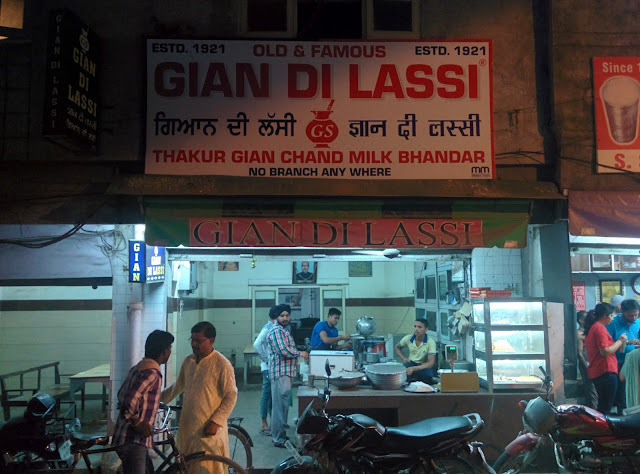 Both Ahujha and Gian Di Lassi undoubtedly serve amazing Lassi but nothing compared to/our personal favorite was the rich and creamy Kesar Dhaba's Lassi. 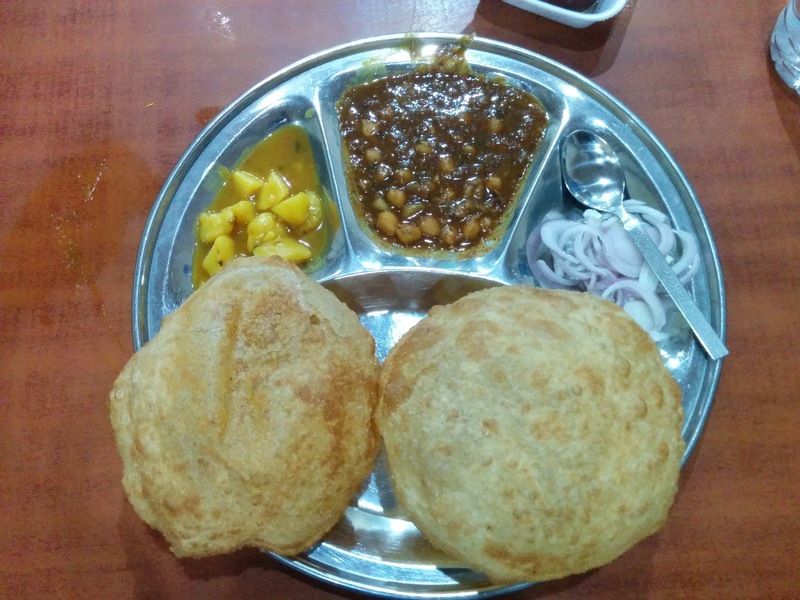 While in Amritsar, it is an absolute must to try the "Amritsari Machhi" and the perfect place would be "Beera's Kitchen" in White's Avenue, the road parallel to Lawrence Road. Their Amritsari Machhi Fry is accompanied with freshly diced onions and thick pudina chutney that adds a good punch of flavor to the fish and a dash of lime adds the extra punch to the dish. 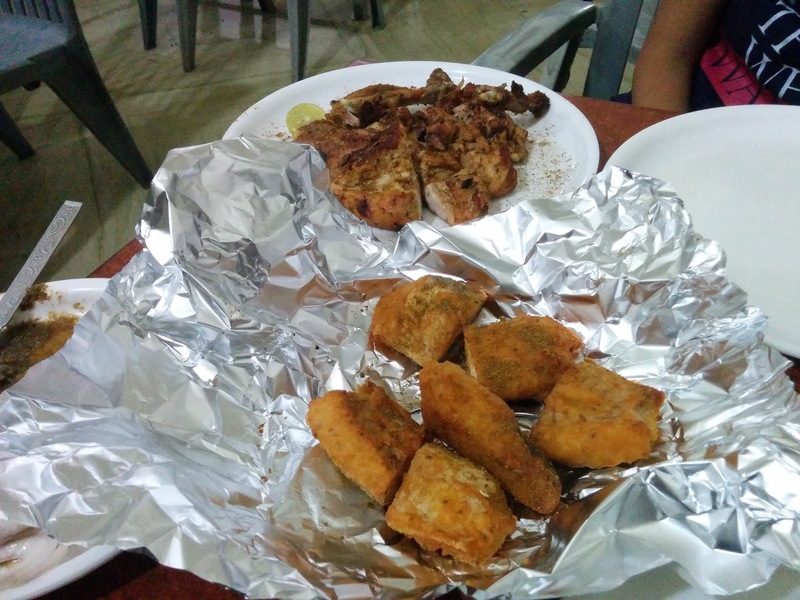 The fish had no bones in it and melted in our mouth, cooked to perfection, sprinkled with chaat masala. The fish is served by weight and the minimum is 250 grams. We had also ordered for their very famous "Roasted Chicken," very mild and tender chicken cooked to absolute perfection. They serve very generous quantities. Though we avoid carbonated drinks, we took an exception here and ordered a bottle of thums up which was the perfect way to finish a heavy meal. All of this costed us Rs.520 which is an absolute value for money. For a heavy Punjabi breakfast, Puri Channa does come to mind and "Kanha sweets" on Lawrence road undoubtedly has the most amazing hot and fluffy puri that was very well complimented with mild spicy channa and tangy aloo curry. A glass of lassi and sinful gulab jamun made perfect desserts. This was by far one of the best fulfilling and yummy brunches that we have had. All of this costed us Rs.230. They have a good and comfortable restaurant. 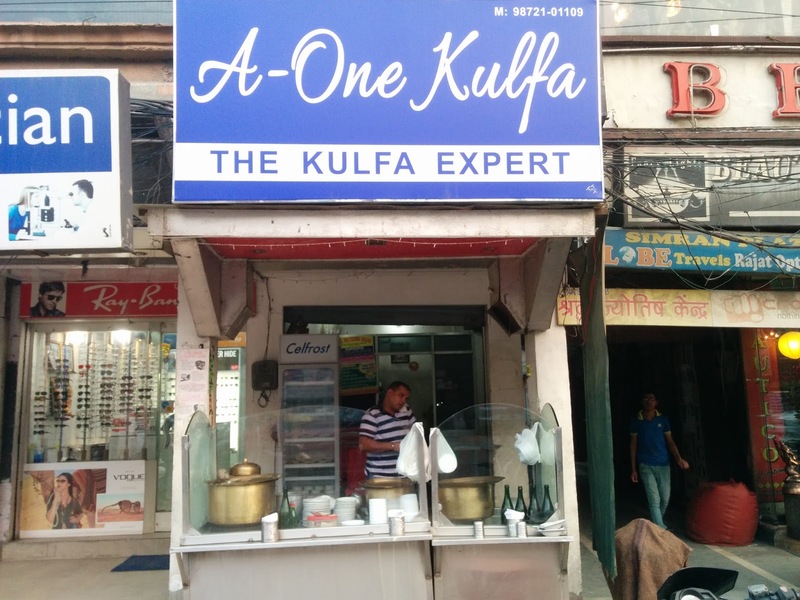 "A1 Kulfa" in Amritsar is less of a dessert joint but more of a landmark or identity of Amritsar. The much famed Kulfa joint has a few outlets across the city. We hit the one on Queen's road. 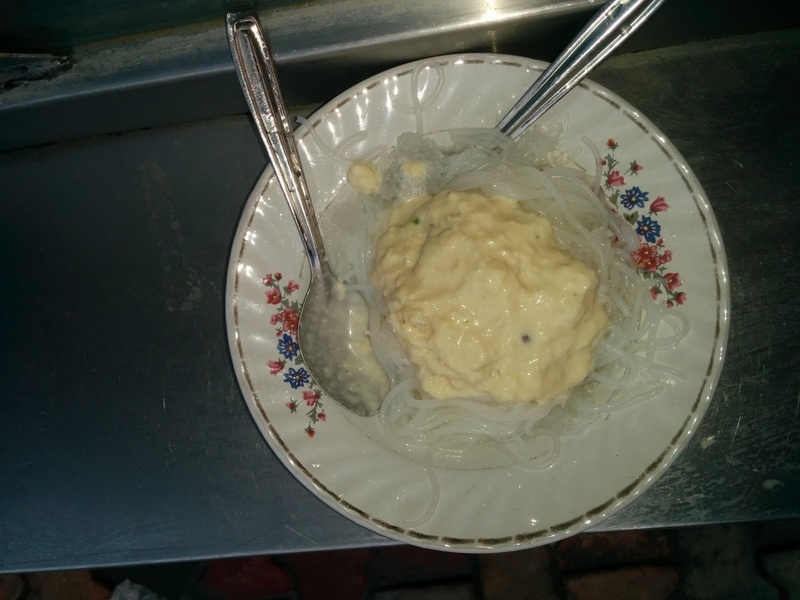 One plate priced at Rs.60 is an amazing blend of Kulfi, falooda, crushed ice, rabdi and topped with flavored essences. All of this together tasted amazing. If you have a sweet tooth, don't feel shy to ask for an extra dash of rabdi. This place serves only Kulfi and commences business post sunset till midnight. The love for food that people of Punjab have can be clearly seen in any of these A1 Kulfa outlets. Even on weekdays post dinner, you can see a fleet of cars eagerly awaiting to be served and you mght have a tough time placing your order.Almost every eat out in Amritsar can be found selling food sans the gloves and A1 Kulfa was no exception. People who are very particular about gloves and caps might find it hard to digest the food from such places. We personally felt that the gloves would not make any difference and would recommend you to shed your inhibitions and savor the yummy food the place has to offer. If you are very particular of people wearing gloves and handling your food, be warned this place is not for you. If this is the only reason you want to skip this pace, you are certainly missing on a delightful dessert. Even on weekdays, at night you might have a tough time placing your order. There is usually a fleet of cars eagerly awaiting to be served. On Queens road diagonally opposite to A1 kulfa there is a treasure trove of street food. Several shops that sell different Indian delicacies have set up stalls that come alive post sunset. There are way too many options to choose from- chaat, chinese, South Indian, Sandwiches and much more. If you are a fan of street food this place is a must visit. If you prefer to have only vegetarian food "Sagar Ratna" restaurant on Queen's road is just the perfect place. 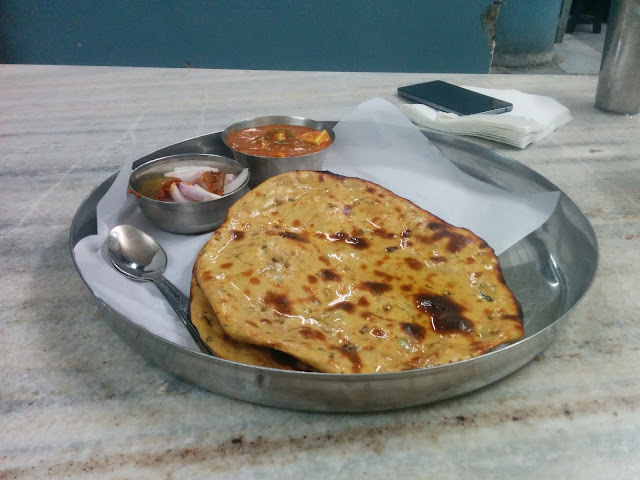 We tried paneer butter masala, missi and butter roti. The restaurant also serves South Indian food. The dosa is ok and the chutney is refrigerated and served cold. Undoubtedly the food was amazing and service equally good. The total bill was Rs.324. Friends dhaba on queens road would be an ideal restaurant for a good meal at a decent price. They have a wide variety of veg and non veg delicacies to choose from. We ordered a chicken biryani that was very flavorful, mild in spice and the tender chicken was cooked to perfection and had generous portion accompanied by fiery gravy. The very humble dal fry was also done very well with neatly sliced ginger and good amount of flavors. It went really well with roti topped with generous amount of butter. All of this costed us Rs 350. The service standard is pretty ok. Crystal restaurant at crystal chowk is a good restaurant if you prefer great ambiance over good food. Steeply priced menu clubbed with moderate food and service standards welcomed us. We had ordered chicken biryani and mixed raita that costed us Rs 686. Just that for a fraction of this price we have had better biryani. Crystal resto and lounge on Queens road serves amazing and wide variety of ice creams. We tried the bubblegum flavor and casatta and it was quiet good though the quality of the cone could be better. The generous scoop of softy is priced at Rs 25. Ha ha yeah :) we were drooling while writing too!! Amritsar is a foodies paradise. Mouth watering! I yearn for Amritsar Di Badiaan! So true, Punjab serves some amazing food! Thanks for sharing your story :) I am trying to put a plan to get there this year. 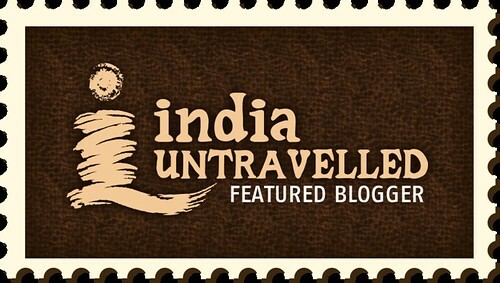 If I had 5 days in Amritsar, what other activities can you suggest? 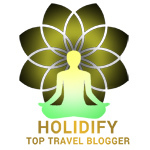 Thanks for the comment, do check our blog post on Amritsar http://screamingpiston.blogspot.in/2017/01/amritsar-heartland-of-punjab.html Hope you have a fab trip. Awesome post! There is no end to food trails in Amritsar.